Giant Invitations is Australia's leading manufacturer of designer wedding invitations, wedding stationery, engagement and save the date cards. Unique and elegant designs coupled with cutting edge technology and superb attention to detail, we are in constant pursuit of creating special memories for Australian couples. Our highly creative designers are experienced in the art of creating elegant engagement invitations that will embrace the spirit of your special occasion. From a large variety of themed, hand-picked selections you are sure to find a design that will best reflect your wedding theme and personality. By utilising our advanced web search technology, finding a suitable card that matches the colour scheme and your wedding theme will be literally at your fingertips. Our wide range of highest quality paper textures and special finishes such as Swarovski crystals, ribbons, hand- made materials and elements will add that special touch to make your wedding invite even more special. Giant Invitations apply the latest technology in paper crafting, utilising variety of techniques such as laser die- cutting, embossing, engraving, foiling and many more. Here at Giant we also offer an array of design prices that’s flexible to any wedding budget. Redefining the definition of cheap invitations, our inexpensive and affordable invites will astonish you with its premium quality. We have over 20 years of experience in combining elements and finishing process to deliver only the best and most appropriate invitations that we hope will make your special event even more special. Our dedication and devotion to designing premium wedding invitations has even captured the attention of highly esteemed personalities. 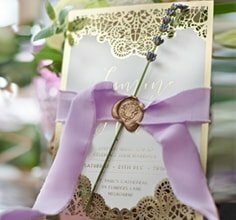 Make a lasting impression with unique and elegant wedding invitation styles. With over 300 products available online, the choices are limitless. But if you have an idea of your own, just send us your brief and we will custom create it for you! Australia's largest stationery design specialist with branches in the USA and Europe. All it takes is 6-8 business days for us to have your wedding cards printed and sent to you! Sample our INVITES - FAST! To truly appreciate the quality and design of our wedding invites, order a sample that will be mailed within one working day. Over 15 years of experience in print and design, with a global pool of top design talent. Our vision is to capture the magic of our couples’ special event and depict their love story on paper.